The Kangal Dog is one of several Turkish livestock guardians. Livestock guardians do not herd their charges, but instead protect them. Kangal Dogs guarded both sheep and goats, living with the animals and fending off predators such as wolves and bears. Traditionally when a dog made its first wolf kill it was rewarded with a special collar that helped protect its neck from wolf bites. During times of war these dogs were trained to leap up and drag mounted warriors from their saddles and bring them to the ground. It gains its name from the Turkish word karabash, meaning 'black head'. The Kangal Dog is one of three traditional livestock guardians within Turkey, with its range being in the central part of the country. The other two are the Akbash Dog from the western region and the Kars Dog, a variant of the Central Asian Ovcharka, from the eastern region. Their origin remains unknown, but they have existed within Turkey for centuries and are likely related to the other European livestock breeds. 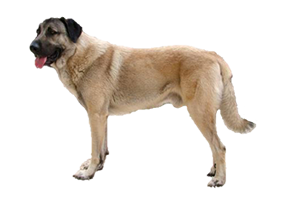 Both the Akbash and the Kangal Dog were used in the development of the more well known Anatolian Shepherd Dog. Is the Kangal Dog Right for You?